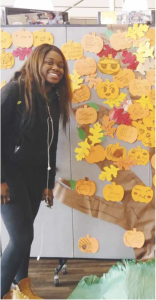 Posted by Torch Staff on October 30, 2018 in Lifestyles. Though many Ferris students don’t know the history of Halloween, there are multiple concepts and traditions that the holiday holds beneath its evolving tricks and treats. “I know when it was starting out, it definitely didn’t involve clowns and ghosts. People have told me that it has to do with people believing that spirits are crossing from our world to theirs. I’m not sure if that’s true though,” Ferris pre-nursing freshman Megan Shoemaker said. Tracing back at least 2,000 years, according to livescience.com, Halloween was also known as All Hallows’ Eve, and was a time where pre-Christian Celtic festivals were held to celebrate the end of summer, known as Samhain to pagan Celtics. The “hallows” in its title refers to a Christian reference to saints. According to livescience.com, dressing up for Halloween could also be called “mumming” or “guising,” as people used this practice to disguise themselves as they traveled town asking for food. “I remember when I was in high school, we would always TP someone in our friend group’s house on Halloween night. Looking back at it, it was kind of mean,” Ferris health care systems administration sophomore Chelsea Miller said. As Halloween progressed, it lost some of its original traditions and became more than a night to dress up. People began playing tricks on their neighbors and friends, and, according to livescience.com, grew to acts of vandalism and more serious matters. Though Halloween is now known as a night to dress up and go out with friends, there are still events happening in Big Rapids to celebrate Halloween’s newer traditions. For more information on Halloween events, visit calendar.ferris.edu or bigrapids.org/events.